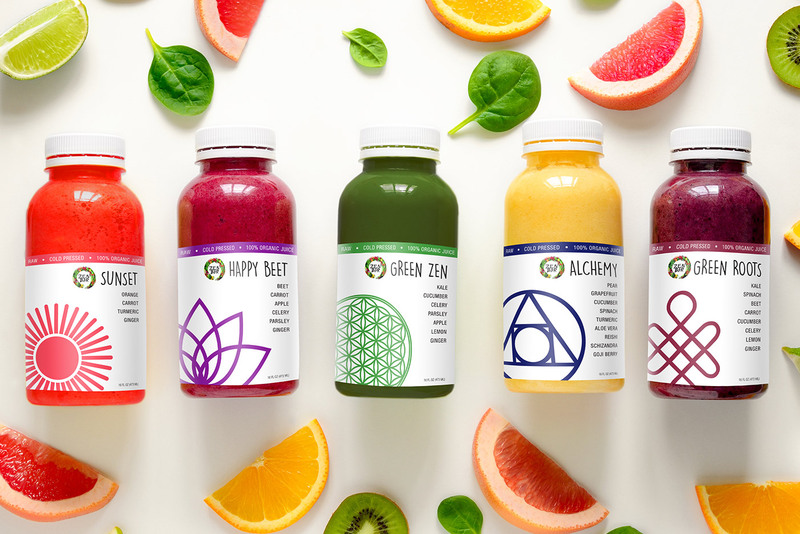 KARMA had already formed a partnership with Zen Bar, a juice and smoothie bar located in the heart of South Florida with the redesign of the labels for their bottled juices and shots. 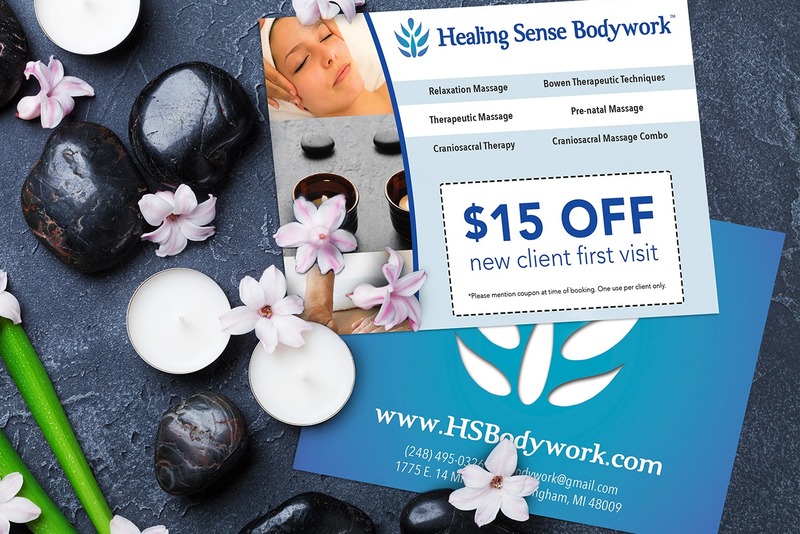 After the packaging project was completed, the local juice and smoothie bar was eager to have us help expand their new branding with some flyers and new business cards. 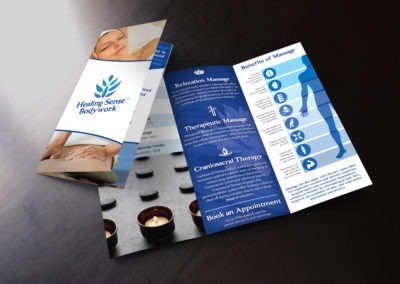 Once the business cards were done, we moved on to the juice and smoothie bar flyer design which was able to take its queue from the business cards. 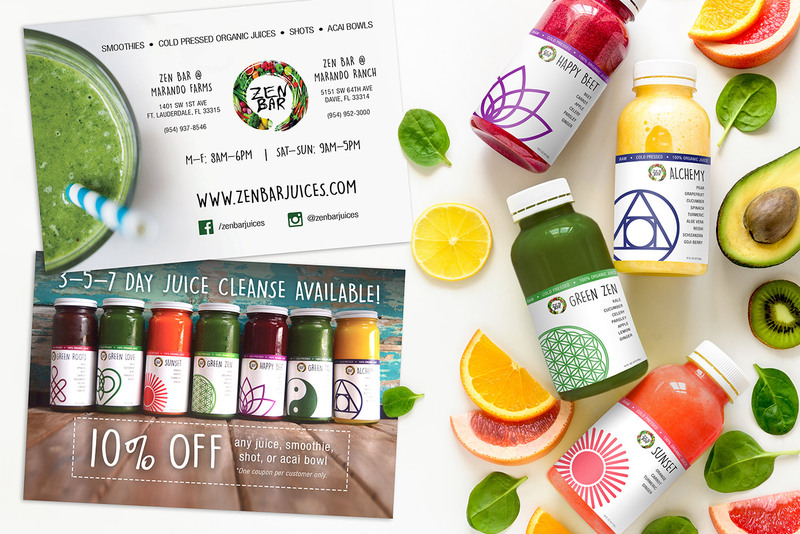 Zen Bar had a brand-new Juice Cleanse program and wanted to feature it on the flyer design. 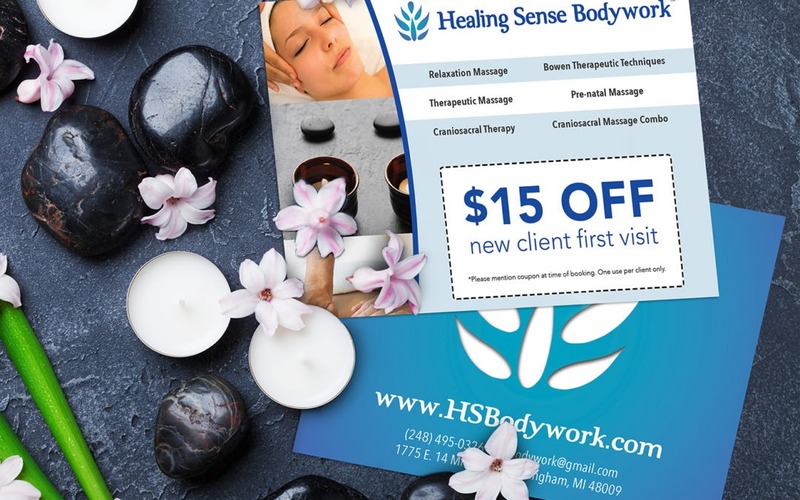 To entice new customers and encourage current customers to return, a 10% off coupon would be included as well. Store locations and hours would also need to be featured on the juice & smoothie bar flyer and stay consistent with their new business cards and juice labels. 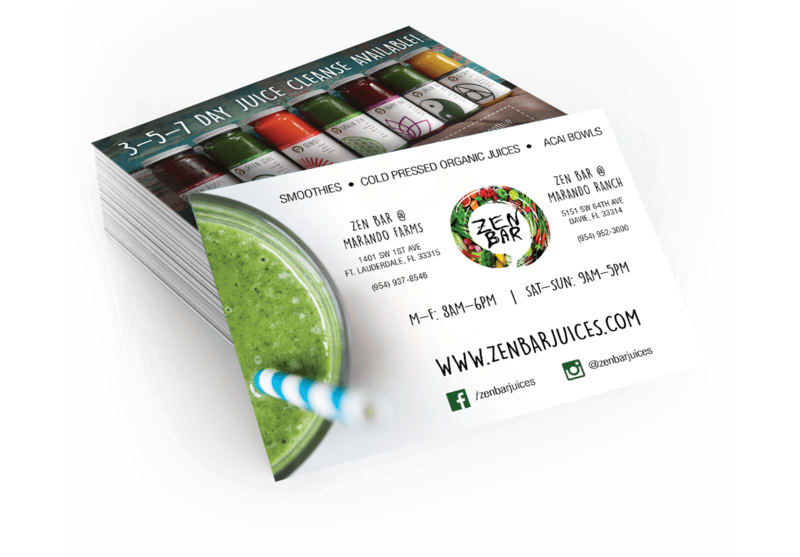 The juice and smoothie bar flyer was designed so the front matched the business card and highlighted store locations and contact information in an easy to read layout. The back featured an image of their new packaging along with a call-out above it to promote their new Juice Cleanse. 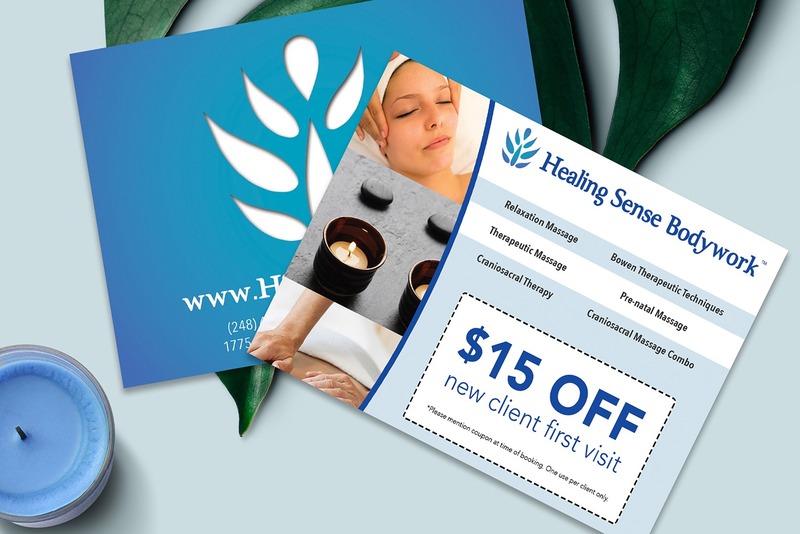 The 10% OFF coupon was placed below in larger font, making it the focal point to call attention to the discount. 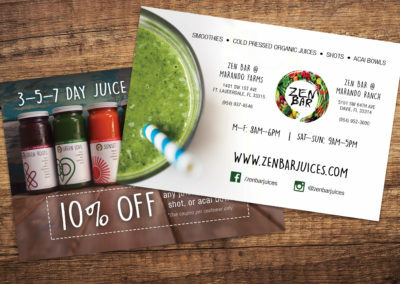 Zen Bar, a juice and smoothie bar in South Florida, had previously worked with KARMA to design new labels for their bottled juices. 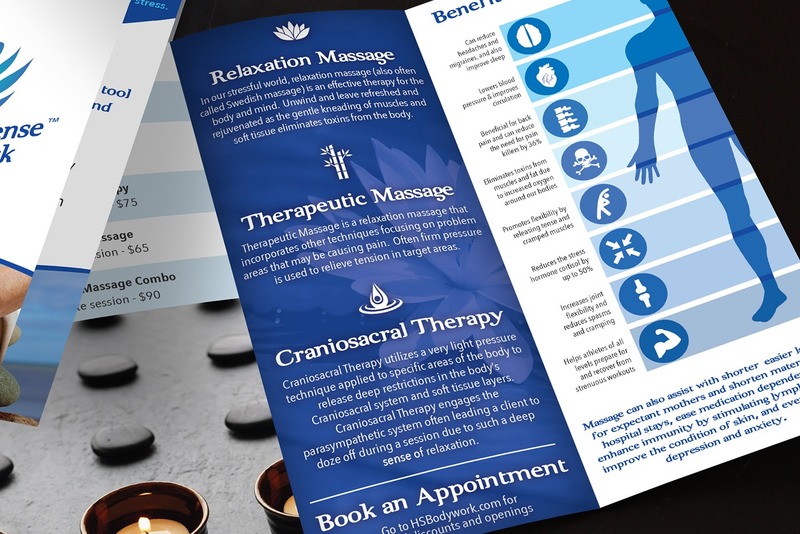 Now it was time to update Zen Bar’s business cards to match their bright and fun new packaging. 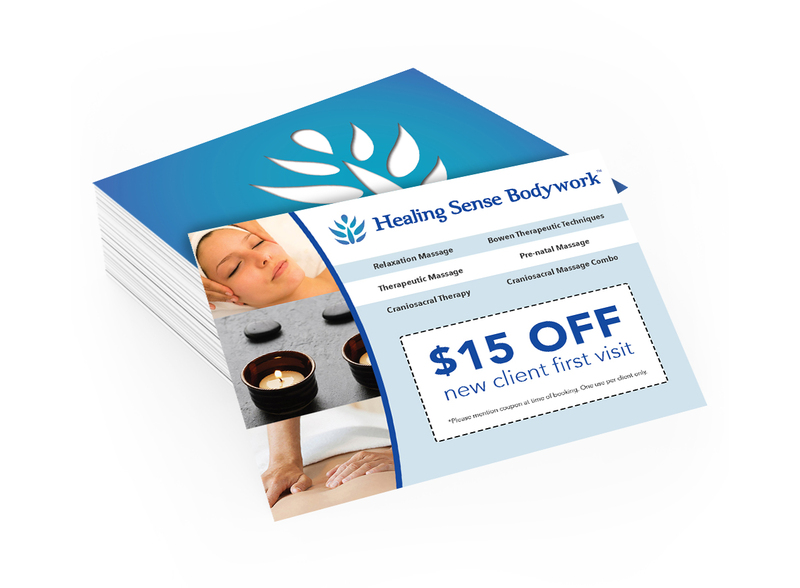 The juice and smoothie bar business cards as well as a new coupon flyer were designed in tandem with the new branding. 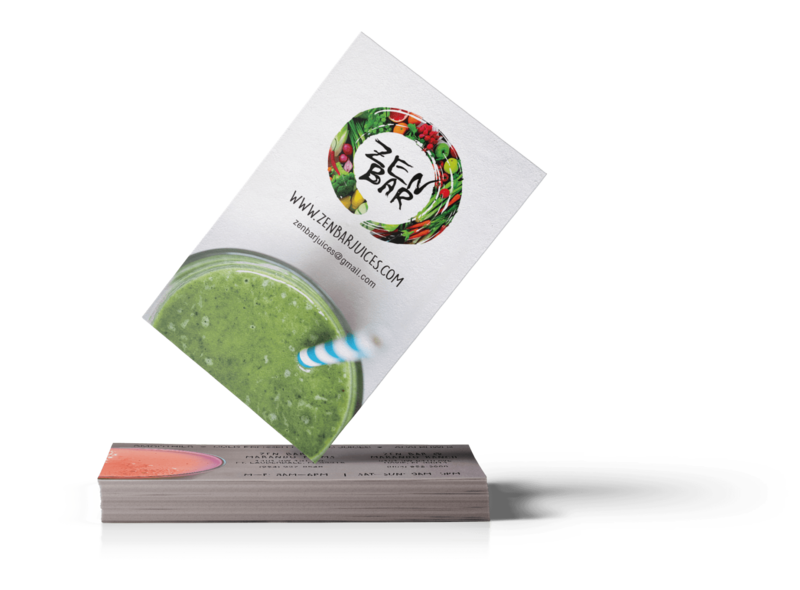 Zen Bar wished to keep their current logo but needed a new identity built around it for their new packaging and printed materials. 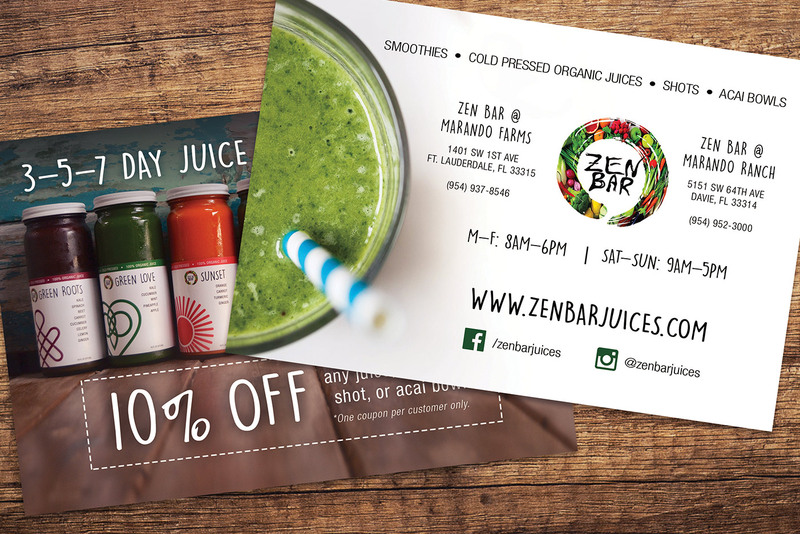 For the smoothie bar business cards, we needed to highlight Zen Bar’s location, as well as their hours of operation within a small space, while also staying consistent with the brand’s bright and vibrant feel. 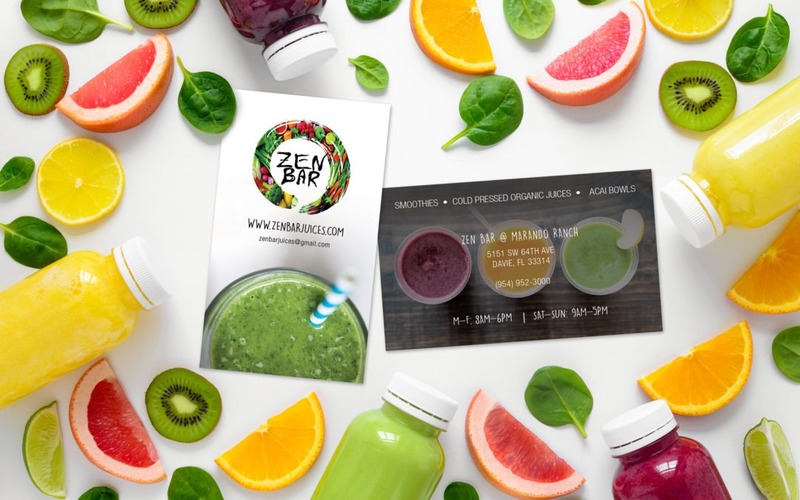 KARMA was able to give the juice and smoothie bar business cards a fresh new look, incorporating vibrant colors which reflect their local organic cold-pressed juices, smoothies, and acai bowls. 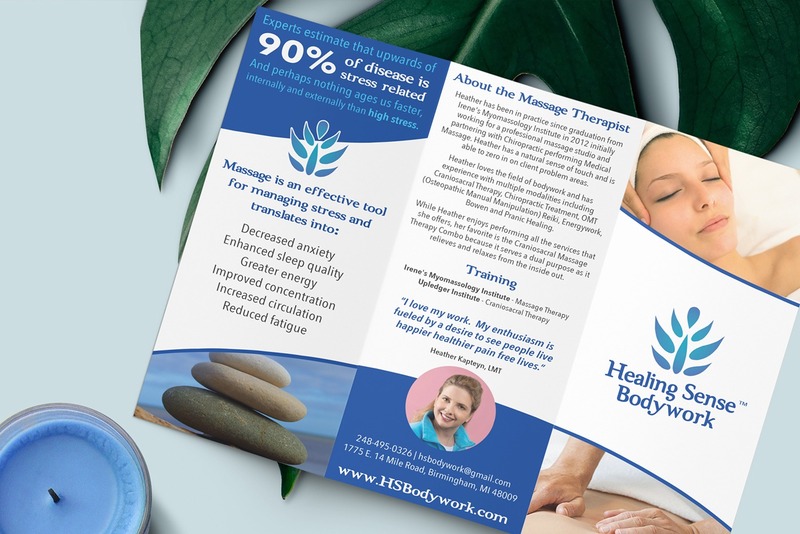 The business card design utilized a clean, bright design which speaks to the freshness and health-conscious aspect of the Zen Bar brand. 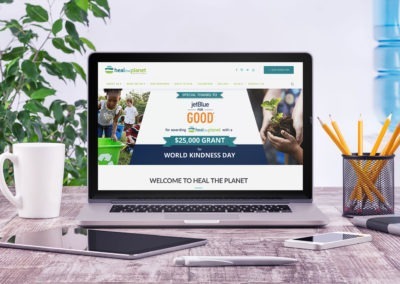 KARMA has worked on several projects with Zen Bar. 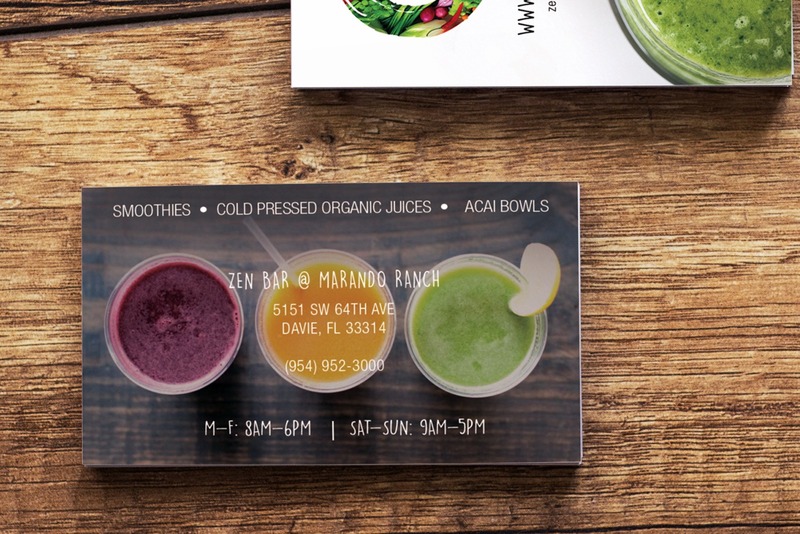 Redesigning their juice labels was our first collaboration with this juice and smoothie bar in South Florida. 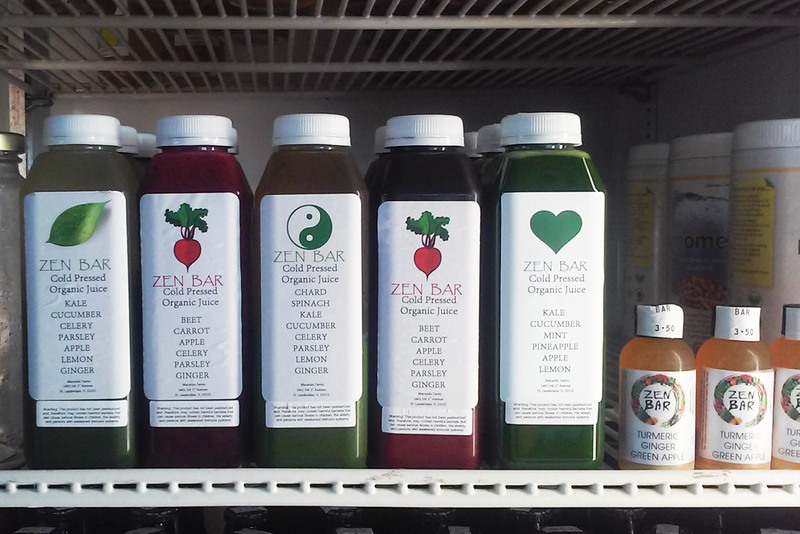 Zen Bar needed a more professional looking label for their cold-pressed organic juices. 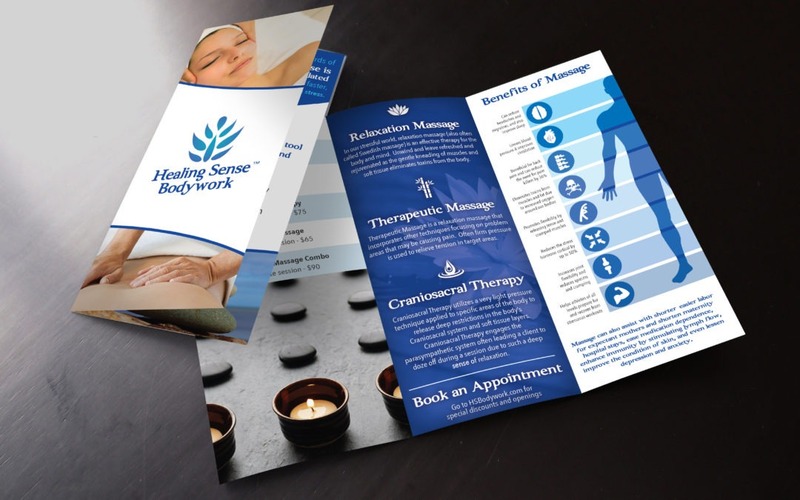 The objective was to create a bright, authentic look for their brand, which would capture the customer’s eye and help increase sales. 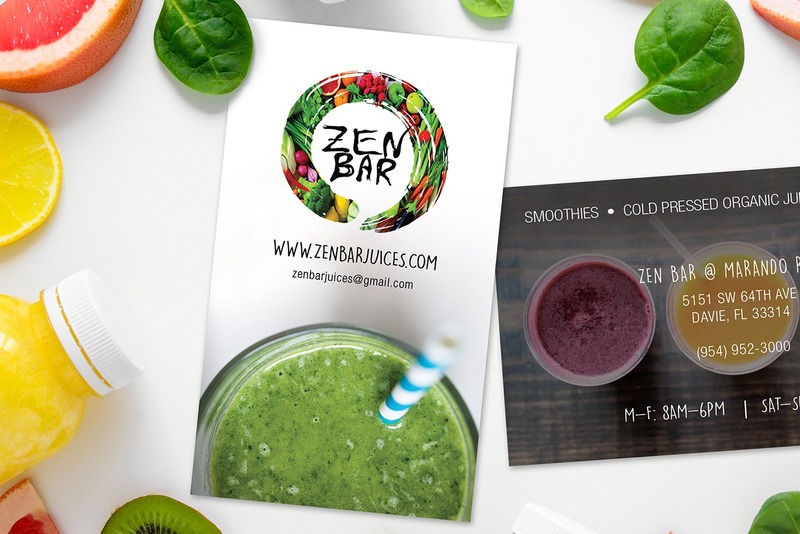 Zen Bar’s current logo needed an identity built around it for their new juice labels. 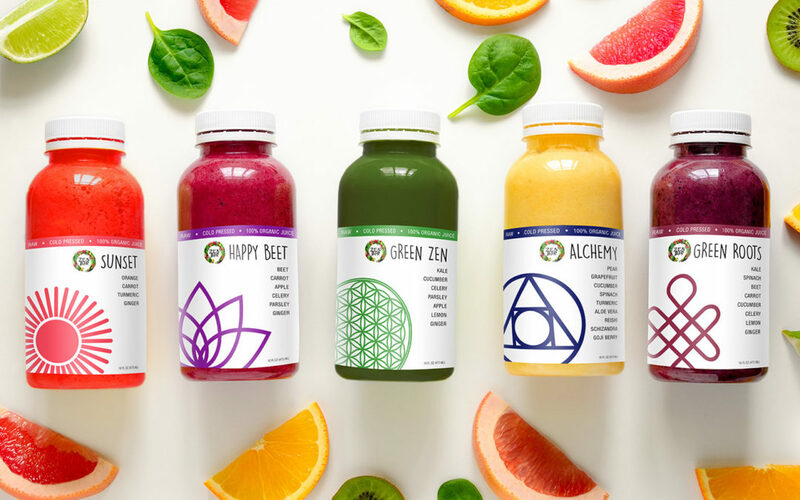 Their current labels utilized a set of icons to quickly identify each juice, which was something we wanted to keep as a vital element for the new design. It was also important to place the ingredient list in front, so customers can easily make a selection without needing to open the case. This placement also emphasized that their juices were made of 100% clean ingredients, which is a significant selling point. 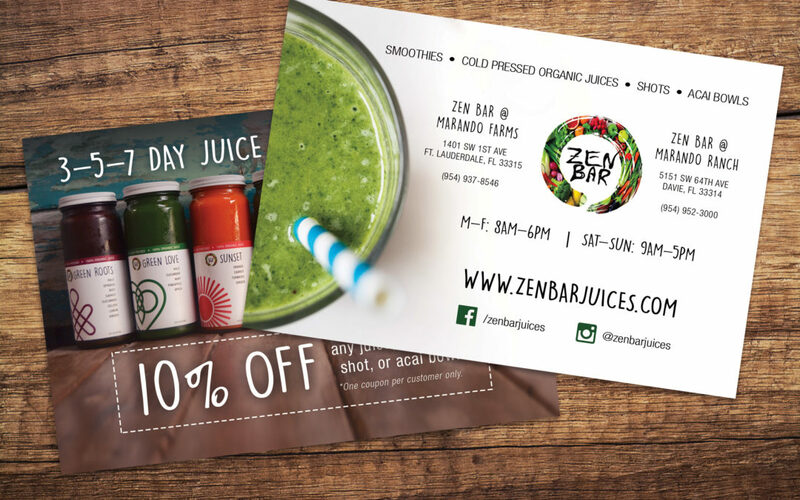 KARMA gave Zen Bar’s juice labels a fresh new look featuring bright, vibrant colors and a genuine feel that naturally reflects their local organic cold-pressed juices, smoothies, and acai bowls. We also created new icons and a color scheme for each flavor, which helps customers easily identify the juices when displayed on the shelf.